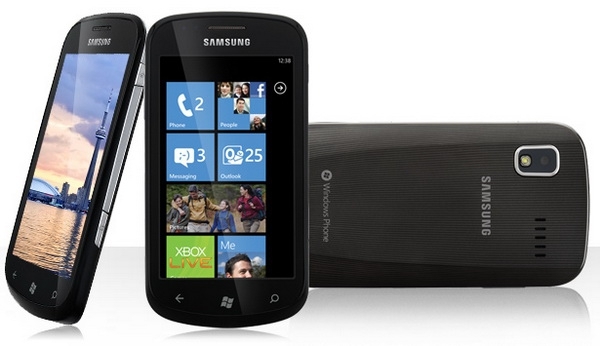 "Say hello to Windows Phone 7 with the Samsung Focus. Receive live updates from the dynamic Start Screen, enjoy mobile gaming with Xbox LIVE integration and manage your multimedia with Zune. If you need to stay productive, review and edit documents with Office. View all these features of Windows Phone 7 on the crisp 4" Super AMOLED screen." Today is the day that Windows Phone 7 devices are popping up all over the place - in Canada, Rogers has launched the Samsung Focus. $199 on a three year contract, or $599 without a contract. I'm going to try and get my hands on one of these today...are you buying a Windows Phone 7 device today? The phone is quick; granted I do not have many pictures loaded yet, still more than 800 contacts, One Note docs etc. It seems that the only way to "wake up" the phone is by pushing the button on the top, taping the screen does not seem to be enabled. Another thing I really dislike is that it seems impossible to list only your Exchange email contacts; all the people in my Messenger account are listed and deleting them from the phone..... delete them from Messenger too. More options please!!! Instruction manual is pathetic to say the least; t is a completely new OS, more info are needed. Not sure if it is a T Mobile or HTC issue but it is inadequate. Personally I always liked the GUI concept and now that I am using it..... I still do. Granted, people coming from WM 6.5 will have to adjust to click arrows instead of swiping on the screen but I do not feel it as annoying or more cumbersome; it is just a different paradigm. I hope that MS will come out with an update version of WMDC; for example the fact that in order to copy pictures to the phone I have to open Zune, select the pictures, drag them etc. is not as linear as before when the phone was just listed under Windows Explorer and the folder were exposed. To conclude: I think I will keep it although I need more time before, eventually, feeling ready to retire my HD2. Last edited by Fritzly; 11-08-2010 at 09:09 PM..
How are you going to approach Rogers on this? (as an upgrade?) Or are you just going to try to find one on the open market? Can you confirm the search engine in IE is set to google rather than bing? Thanks. Keep in mind that this device is a T-Mobile one; I do not know about other carriers though. What is wierd is that under Settings the option 'Let Bing suggest site as I type" is checked. Thanks, the UK O2 HD7 has its browser search engine set to yahoo. I was really hoping I would be able to use a device without having to go through google, I dont hold out much hope that MS is going to be able to keep to their promise of no 3rd party customisations if they have already started allowing changes to the OS. The biggest issue is the lack of choice; it seems that with WP7 users will be at the mercy of carriers until they will find a way to jailbreak it. Btw on my HD7 if I open the browser I get Google but if I use the search button I get Bing...... talking about consistency. What sort of an Exchange server is it? I'm with 4smartphone as a hosted Exchange provider, and I set it up without a problem in about 15 seconds. Correct. But I've never had a phone do it any other way - wouldn't it turn on constantly in your pocket if touching the screen turned it on? Nope, not going to happen - WMDC is dead. Desktop file sync is dead - much to my own personal dismay. If file sync does come back, it will come via the Zune software. And in your specific example, I think you'd find it's pretty much the same number of steps...plus, you can use Sync Groups to automate photo sync - pulling your recent 30 days of photos for instance - which you couldn't do with WMDC. Yeah, that's pretty dumb - you can access the photos on your device via the desktop software, but I agree it's weird that they lock the device like that during a charge/sync. They do the same thing with the Zune though if memory serves. All the more reason to get a dedicated charging station. Yeah, as an upgrade - I've had my Samsung Jack for probably two years now, so I should be able to get some sort of discount price. If not, oh well.